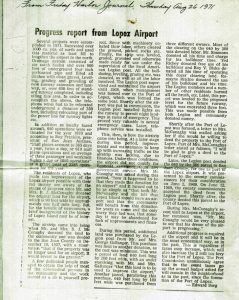 1957………..Lopez airstrip was donated to the Lopez community by Mr. and Mrs. B. J. McConaghy deeding it to SJ County. 1957 to 69..The dirt airstrip was originally maintained by American Legion, the first night runway lights were installed. 1957 to 69..Land was purchased to expand airport from Gallanger’s with labor donated by Simmons, Ted Richey Sr., Romayne Ritchie and Roy Blake.. 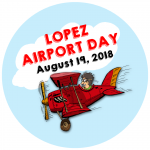 1968………..Port of Lopez was formed to fund and operate the airport. 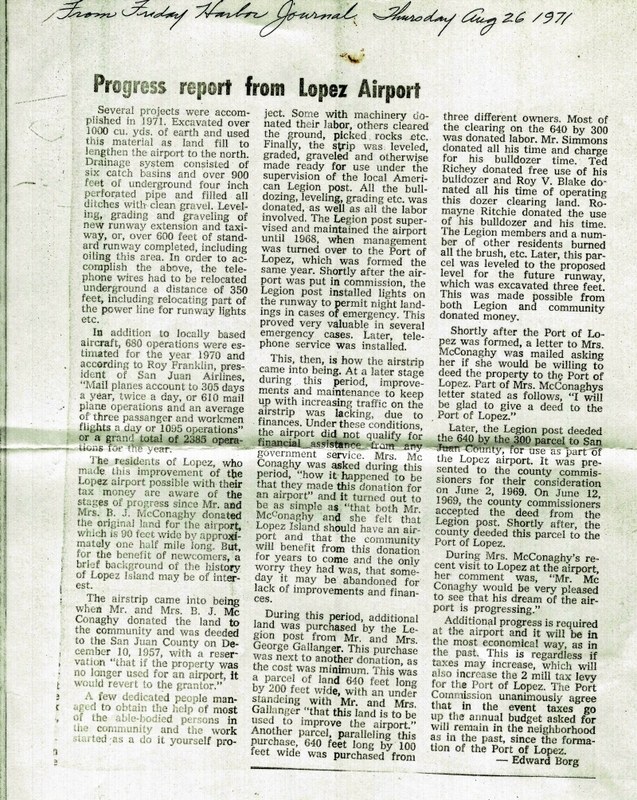 1969………..Airport deeded to Port of Lopez. 1970………..Airport had 2385 flight operations, 1095 operations were San Juan Airlines according to Roy Franklin. 1971………..Runway was lengthened 600 feet to the north and leveled, power lines were removed. 1971………..Hangar A, airport’s first hangar was built by the “Lopez Flyers” (Jim Higginson, Bill Carpenter, Clay Barton, Bob Olsen, Art Anderson & Ike Scherer). 1972………..Terminal and administration building constructed. 1978………..Runway was leveled and resurfaced, using FAA AIP funding. 1980………..After a tragic accident caused by aircraft hitting a deer, wiild life fence enclosing runway was built, using FAA AIP funding. 1981………..Hangar B, 1991- Hangar C and 1996 – Hangar D built and paid for by “Lopez Flyers”. 1987………..Runway, taxiway and apron rehabilitated, using FAA AIP funding. 1998………..15 lower hangars were built by local pilots on land leased from the Port (now 34 hangars on airport). 2001………..Purchased 2.5 acres on Shark Reef Road (Murphy Property) in RPZ to remove trees, replanted Oregon Wax Myrtle. Funded with FAA AIP funding. 2001………..Extensive tree topping for runway approaches, using FAA AIP funding. 2002………..Rehabilitate runway and taxiway, using FAA AIP funding. 2004………..Major drainage and swale at the south end was constructed using FAA AIP funding. 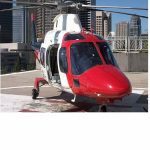 2004………..Port purchased “Lopez Flyers” property and leases for hangars B, C and D using FAA AIP funds. 2005………..Acquired airport buffer land, approximately 18 acres on Channel Rd. 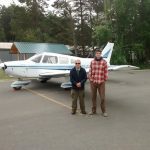 using FAA AIP funding. 2007………..Island’s first cell tower constructed on airport property funded by Sprint/Nextel. Tower owned by Port leased to cellular carrier. 2012………..Reconstruction of taxiway, connectors and apron using FAA AIP funding. 2012………..Acquired Sea Plane landing zone in Fisherman Bay from Kenmore Air. See: Sea Plane page. 2015……….. Acquired approximately 18 acres of property and cleared obstructions at both ends of runway. 2015…………Port purchased it’s first public marine access property, “Bayview Day Park” on Fisherman Bay. 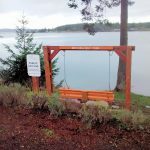 2017…………Airport camping and picnic shelter built using SJC Economic Developement Grant and volunteers Bruce Dunlop and Kenn Aufderhar. 2015 to 18…Comprehensive FAA approved master plan developed for airport using FAA AIP funding.